I first read A WRINKLE IN TIME in fourth grade, as a class assignment. It was right around the time I was in love with Bruce Coville's ALIENS ATE MY HOMEWORK. It was also right when I was on the verge of beginning my Star Wars obsession (I devoured every Star Wars novel ever written during my tweenage years). In other words, though I was already an avid reader at that age, I was just beginning to learn the wonders of "science fiction fantasy". So, along with my fellow "Gifted and Talented" classmates, I cracked open this odd-sounding book with nerdy enthusiasm...and my nine year-old mind was blown. "...there is such a thing as a tesseract." I remembered that line. That line was burnt into my brain, because as a kid--a kid with an extensive vocabulary and science-y interests much like the main character, Meg--I'd never heard the word "tesseract" before. And it was at that line that I was officially hooked. All because Madeleine L'Engle did something amazing: she didn't tell me what a tesseract was right away. Instead, I was left trying to imagine what this strange word might be and why it is important to Meg's mother, and what it has to do Meg's father, and how this odd old lady knew it would mean something to this family. Before I started my reread, I jotted down everything that stuck with me from my childhood about this book: tesseracts, the explanation of how time wrinkles, the weird world where everything is the same and rigid and structured, and Charles Wallace fighting the times tables. Most of all, though, was this one sentence I wrote down and underlined several times: "IT MADE ME THINK SO HARD MY BRAIN HURT...BUT IN A GOOD WAY". As a kid who was nerdier than most, getting to read a story in which I couldn't guess where it was going--a story with fantastical elements that were explained in a logical way and concepts that philosophy majors could debate in graduate level courses--was like candy for my mind. Too often, adults fail to give kids enough credit. Kids can think. Kids can think pretty big, serious, and complicated thoughts. Instead of dumbing ideas down for her readers, Madeleine L'Engle introduced ideas. She counted on her young readers to take these concepts and think them through for themselves. She knew kids were smart, and so she wrote a smart book for them. I cannot applaud her enough for this. 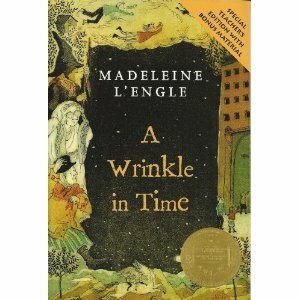 A WRINKLE IN TIME is one of my favorite childhood reads, because it encouraged me to think. As an adult, I've clearly take that lesson to heart. I'm a science educator. I write science-based adventures for middle grade readers. In all that I do, I try to get kids to think. Rereading A WRINKLE IN TIME has been enlightening, because it's put perspective on what I do and why I do it. Every now and again, a book comes along that really does change your life, and after rereading A WRINKLE IN TIME, I'm more convinced than ever that this was one of those books for me. If you've never had a chance to read it, do yourself a favor and snag a copy somewhere. Better yet, get a copy, read it with a kid, and then have conversations with them about it. This clever, thought-provoking novel is guaranteed to worm its way into your brain and never completely let go. And don't be surprised if little Charles Wallace worms his way into your heart and stays there forever, too. Katie Slivensky is a science educator and aspiring middle grade novelist. She has a Master's degree in paleontology and has spent countless hours digging up fossils in the badlands and measuring bones in dark museum basements. She now works for the Museum of Science in Boston, where she teaches outreach programming to kids across New England, and also runs their rooftop Observatory. Her blog, discoverific.blogspot.com, aims to help every-day people get to know science a little better. You just reminded me why I love this book so much. It was truly a life-changer for me, too.. and it boggled my mind to boot. Nice to be reminded!